Home Do Bears Live at the Beach? YES! Do Bears Live at the Beach? YES! Did you know that there are over 6,000 black bear sightings in Florida every year? Some live in Point Washington State Forest near Grayton Beach. Over 40 percent of the land here along Florida’s famous Scenic Highway 30A is protected natural habitat, so there are over 25,000 acres for bears to freely roam. 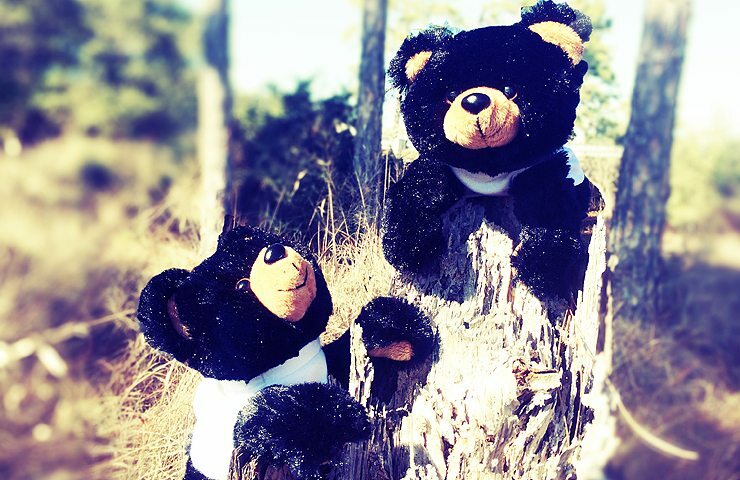 Click here to take home your very own Grayton Beach Bear! Black Bears have a keen sense of smell — 7 times more powerful than dogs! They can detect odors over a mile away. They can go without food for 6 to 7 months during hibernation. Bears are very curious, resourceful, and intelligent. They have an excellent memory and remember food sources for many years. Black bears are nervous, shy and easily frightened. They can cause serious injury if startled, cornered, or provoked. Bears usually prefer to avoid humans. However, bears are opportunistic and will take advantage of readily available food. Bears can become bolder when hungry or habituated. Black bears are very powerful and strong, and should always be treated with caution and respect. They are proficient at climbing, swimming, and running. Bears usually avoid open areas and prefer the protective cover of trees and thickets. Their diet consists of approximately 85% vegetable matter, including nuts, berries, seeds, grasses. Travel in groups. Do not allow children to stray or run ahead. Remain on the trail and never hike at night. Always stay alert. “Advertise” your presence by wearing bells, singing, clapping, etc. Do not allow your “advertising” to distract you from staying aware of your surroundings. 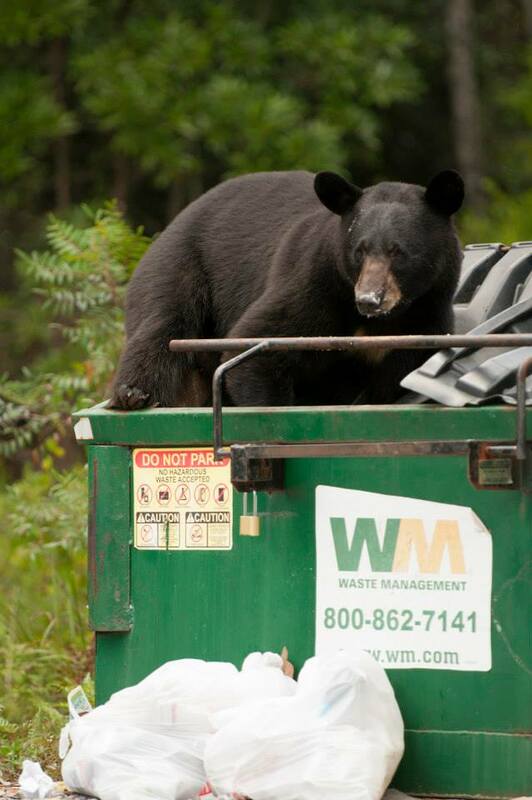 Discard garbage in bear-proof trash containers or pack out in sealed plastic bags. Leave no trace. Never surprise a bear! Use caution when traveling in windy weather, down-wind, approaching blind curves, dense vegetation, and noisy streams, where a bear may not see, smell or hear you coming. Stop, look, and listen. Make noise before approaching these areas. Circling birds and/or offensive odors may indicate an animal carcass. Avoid this area or use extreme caution. Never leave any food or backpack unattended. Bears are naturally afraid of humans, but may become “habituated” or accustomed to people along popular hiking trails. Keep the area safe for humans and bears by never feeding or approaching bears. Should a bear come near you, he is most likely curious or smells something interesting. If he stands up, he is not going to attack but is trying to get a better look or smell. Bear attacks are extremely rare and by comparison a person is about 67 times more likely to be killed by a dog or 90,000 times more likely to be killed in a homicide. Bears are powerful and strong animals; they should always be treated with caution and respect. If the bear lunges, snaps his jaws, slaps ground or brush with paw, he feels threatened. You are too close. If he continues to follow you, stand your ground and yell, clap your hands, wave your arms, or throw something toward him — repeat until he leaves. As a last resort: Drop something like a hat to distract him, but avoid tossing him food or your backpack as he will quickly learn to confront other humans for food rewards.